After the massive box office success of “The Dark Knight,” the buzz surrounding the final film in Christopher Nolan’s “Batman” trilogy, “The Dark Knight Rises” continues to grow. Bat-fans like Kevin Smith (who recently shared his conspiracy theory about the film) are especially excited about it. One such fan is Gabe Waxman, who was lucky enough to have the movie shooting practically at his front door. 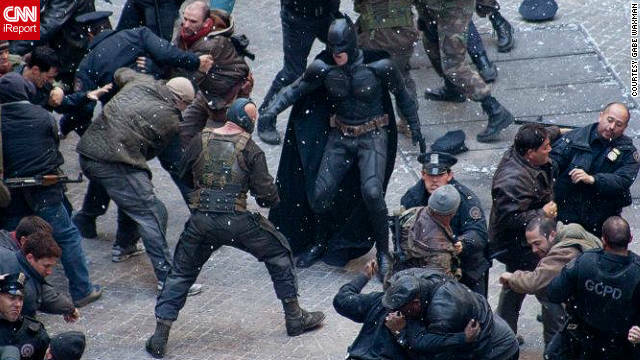 Waxman shot footage of several exciting fight and stunt scenes from his window, and uploaded the videos and photos to CNN iReport. Waxman said the crew for the movie, due in theaters on July 20, 2012, have been shooting since the last weekend of October.